Turtles are actually living inside of their rib cages! That adaptation has allowed them to avoid predators. As turtles grow, their skutes, the bony plates that make up the shell, expand. And the outer coating sheds as they expand. Shells are a great adaptation to protect against predators. A turtle's shell is actually a part of its ribcage. Jim Andrews, a herpetologist who teaches at the University of Vermont and coordinates the Vermont Reptile and Amphibian Atlas says a good way to imagine it is to think if you could pull all your limbs inside your own ribcage! "You pull your neck in, arms in, you pull your legs in and you're pulling them inside your ribs. [The shell] is really an extension of the turtle's ribs and so he can pull in, pull his head in, pull his arms in, pull his legs in and hide inside his ribcage. So that when fox or raccoon comes around, they can chew on the shell a little bit, but he's got great protection as a result of living inside the ribcage." Box turtles actually have a hinge that allows them to seal their shell so nothing can bite it. Other turtles, like the painted turtle, can't fit everything totally inside of their shells. So if they're caught by a raccoon or an otter, the predator might be able to take part of a leg, or a foot, but the turtle's internal organs are still nicely protected by that shell. That good design has helped turtles survive for a really long time! They've been around since the dinosaurs. "But there are new threats to turtles that didn't exist before, like cars," Andrews cautions. So turtles are facing threats that their strong shells won't necessarily protect them against. Climate change is another threat that turtles are not well suited to. Andrews says habitat loss and climate change are two of the biggest threats facing all reptiles and amphibians. 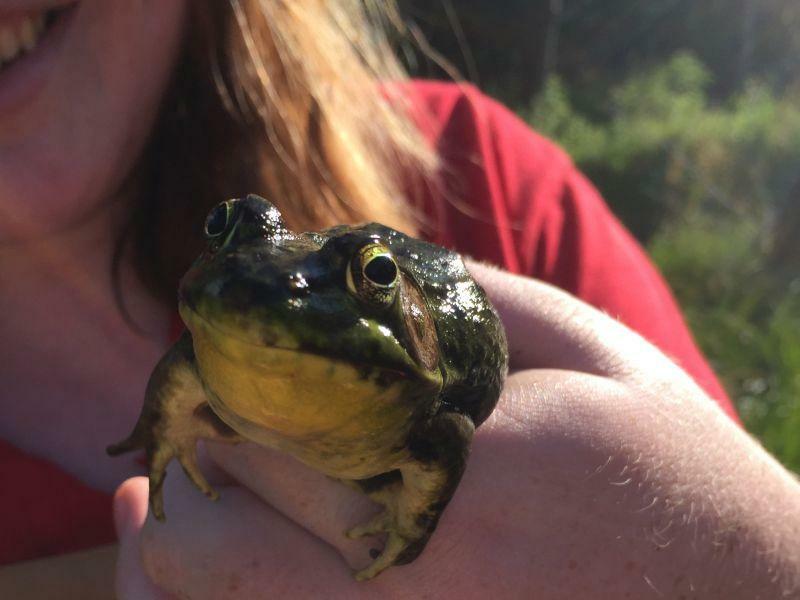 Click listen to hear the whole episode and learn about frogs! Plus, we introduce you to Earth Rangers! Green frogs are very common in the northeastern United States.